Hackney Wick is known for having the highest concentration of artists per square mile in Europe and Hackney Wicked is a celebration of this hub for hip creators and makers. In fact - weak neologism time - it's a bona fide 'artisval' on the fringes of the Olympic site. More open studios than you can shake a paint splattered boiler suit at. Exhibitions and site-specific installations in every direction, including psychedelic light shows and rooftop projections. Two days worth of free live music on the main stage, featuring Quilla Constance and culminating in a riotous set by Victor Menace on Sunday night. 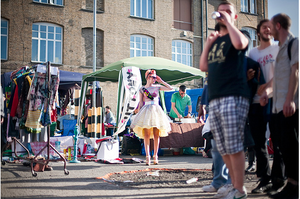 On Fish Island - the bit surrounded by the Hertford Union canal, the River Lea and the East Cross Route road - Stour Space and Counter Cafe host the Corner Carnival with a designers' market, music and food. Snoop around the open studios in the Percy Dalton Peanut Factory and the Forman's Smokehouse Gallery (the closest venue to the Olympic Park - check out the webcam). First time at the Wick? Download the map of all things happening to help you. It's easily accessible via London Overground to Hackney Wick station. Hackney Wicked runs from Friday night till Sunday night. All events and exhibitions are free admission.